Calculate drywall or sheetrock panels, screws, joint compound, and tape needed for your project by entering your room’s dimensions. Optionally include the ceiling if you’re drywalling that as well. Drywall, also referred to as sheetrock or wall-board, is used to cover walls in modern construction. The drywall estimation calculator estimates the amount of sheetrock and supplies needed for your wall-board project. 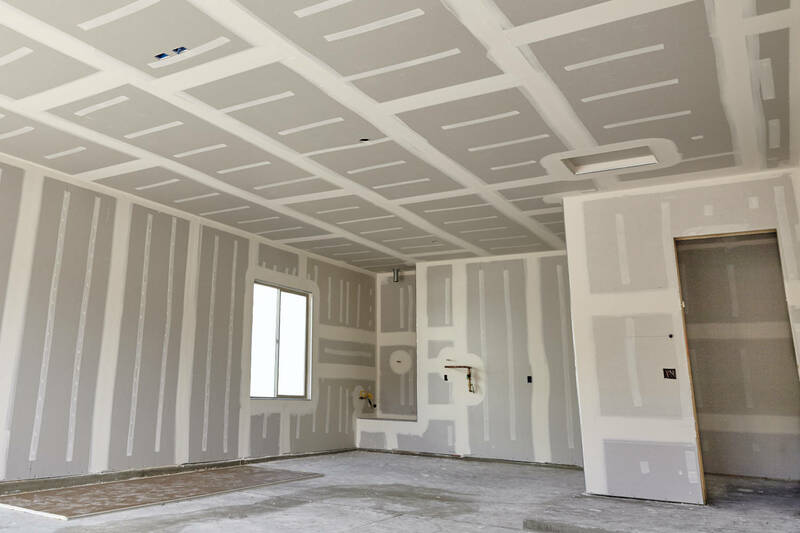 Simply enter the size of your room, and the estimator finds the square footage of the walls, estimates the amount of drywall needed to cover those surfaces, and estimates additional supplies, including screws, joint compound or mud, and tape. For example, estimate the sheetrock needed for a 10′ x 10′ room with 8′ ceilings. The calculator is useful for getting a rough pricing estimate when hiring a professional, or to calculate the amount of materials to order if you’re installing drywall yourself. The calculator estimates material in sheets and includes screws and joint compound. Learn more about the cost of sheetrock installation. To get an estimate of the complete project cost, including labor and installation, use this form to get quotes from contractors in your area..
To find the amount of drywall needed for your project, you need to get the square footage of the walls and ceilings that need to be sheet-rocked. Square footage of the walls is the length in feet times the width in feet of each wall. Finding square feet is just like finding an area, by multiplying the length times the width. Or, to save some effort calculating square footage, you can also use a calculator. If the walls are complex and not rectangular, then it may be easiest to split the walls into smaller sections and calculate each section individually, then add them together. For example, if you are measuring walls that have a vault, it will be easiest to determine the square section and vault separately. If you have doors, windows, or other areas where drywall will not be installed you may want to find the square footage of those areas and subtract from the total square footage figure. This will help your calculation be a bit more accurate and reduce excess materials and waste. After you find the square footage of drywall needed, simply divide by the square footage of the sheet size you will be using to find the number of sheets needed. For example, if your wall surface is 1000 square feet and you’re using 4′ x 8′ sheets, then the number of sheets needed is 1000 / 32, or 31.25. It is recommended to order 10% additional materials to account for cuts and material waste. Estimating the amount of joint compound and drywall tape you need starts with finding the square footage. Different joint compound or mud products have different coverage levels, so it’s best to check the product you intend to use to verify the coverage. If you’re using a lightweight joint compound (not premixed), then you’ll probably need .053 pounds of mud per square foot of drywall. If you’re using a quick setting product, then you’ll likely need .073 pounds of mud per square foot. Drywall tape typically covers about 2-3 square feet of sheetrock per foot of tape. Long sheets are significantly heavier to lift and transport. A 4’x8′ 1/2″ sheet of drywall weighs 54 pounds, while a 4’x12′ 1/2″ sheet weighs 82 pounds. Don’t forget to consider transportation and delivery requirements when ordering materials. Drywall products are very heavy, and you’ll want to make sure you have the appropriate tools for moving large amounts of sheetrock. We recommend using a panel carry tool, which basically adds a set of handles at just the right height to make carrying large sheetrock panels very easy. Bear in mind that more complex framing, layouts, or exclusions will require manual estimation of materials, any automated estimation will have a reduced level of accuracy as the complexity of the framing or exclusions rises. Next Step – After drywall it’s time to finish the space. Estimate how much primer and paint will be needed to finish this room. Or, estimate how many rolls of wallpaper you’ll need. Are You Planning a Drywall Project? Get hassle-free estimates from local drywall professionals and find out how much your project will cost.